Guide to Sutton Maddock Church. Click here to download a copy (Word Document 54Kbs). This includes information not found on this website. Like Stockton, the parish church and Sutton Hall are isolated from the village of Sutton Maddock. 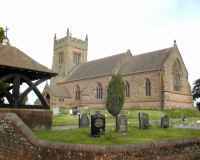 The village is a scattered community, but was probably more important at the time of the Domesday Book, in which it is called Sudtone ("south town") as it was the southern part of the Saxon Parish of Iteshale (Shifnal). The "Maddock" was added in the 13th century when Sutton was granted to Iorwerth Goch (son of the ruler of Powis) for interpreter services between England and Wales in the reign of Henry II . Maddock was Iorwerth's son. The oldest part of the present building is the tower which is mainly Tudor (dated 1579) though the lower part may be Perpendicular. In it are two ancient sculptured stones, one of a grotesque animal over the south window, the other over the east window. But for the most part the church belongs to the 19th century, having been rebuilt in 1888. The previous Georgian building has completely disappeared, there are relics of worship in former times and a parish register dating from 1559. The chalice and patten we use for communion (not kept at church) are dated 1662, the date of the latest revision of the Book of Common Prayer. There has been little change to the interior of the present church since the 19th century - an east window presented by Mr Charles Bruff of Coalport China Factory in 1908, the reedos in 1923, electrical heating in 1963, and the choir robing room (made from the rood screen from Stockton church) in 1974.